The aim of this deliverable is to aid the INACHUS developers and end‐users to understand legal, ethical and societal dimensions of the proposed INACHUS integrated system. It has been produced in the early stage of the INACHUS project, when use cases and processes and business models were not yet defined. Therefore it provides general considerations and guidelines. The ethical and societal investigation of the INACHUS project will continue during the whole INACHUS project lifespan, including the pilots. The main purpose of urban search and rescue (USaR) operations are to alleviate human suffering and to save lives. The INACHUS solution will help in achieving this aim. The “right to life with dignity” approach in the humanitarian aid field emphasizes that the INACHUS project should help USaR crews not only to save lives efficiently, but to do it in a dignified way. Since the collected data can be used for surveillance purposes and for creating sensationalism in the media, it can create tension between ethical values and rights of privacy and data protection. This entry was posted in documents, reports, Uncategorized, WP11 on March 31, 2017 by laureainachus. The claim that the apartment building in Chennai (see post below) collapsed because of a lighting strike sounds- at first- far fetched, since such never was reported before. However, the Polytechnic Südwestfalen, Germany, made laboratory tests that showed that an enormous explosive power is mobilized, when the charge of a lighting jumps from one reinforcement iron to another (when not properly bound together). A possible lesson for engineers and builders in the industrialized countries as well. This entry was posted in documents, external sources, reports, WP 3 on September 6, 2016 by laureainachus. We emphasize that at the moment we do not track permanent plastic deformation or crack propagation. What at this stage is interesting to us is to evaluate if we can predict the absolute moment of breaking of a structural assembly. This first comparison with a real world experiment seems to indicate that this is the case. This entry was posted in blender, documents, script, Uncategorized, WP 3 on March 15, 2016 by laureainachus. 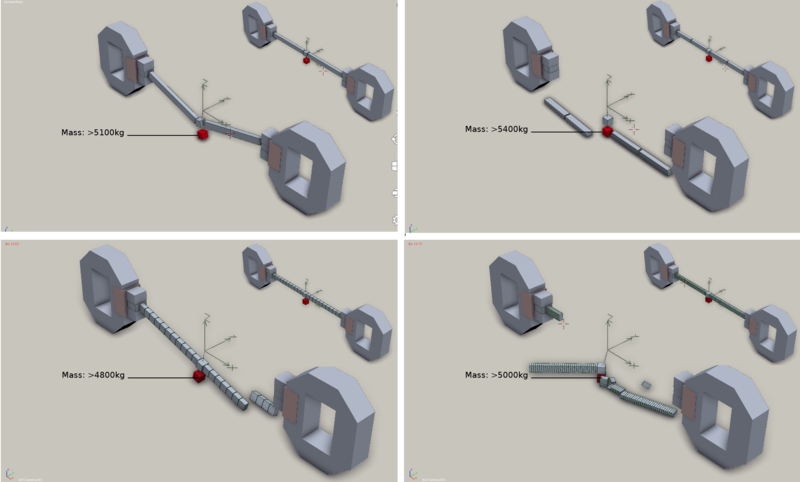 To validate structural performance of reinforced concrete structures many tests on RC assemblages have been carried out under column removal scenarios. They provide valuable information on structural dynamic performance. One such experiments was executed at the Fraunhofer Institute for High-Speed Dynamics by following the specimen design by Jun Yu and Kang Hai Tan: A ca 6 meter long concrete beam supported by a center concrete pillar was loaded with a constant 47kN in form of two huge concrete block weights . The center pillar was then suddenly removed by explosives. The research papers by the Fraunhofer Institute can be downloaded from here. This entry was posted in documents, reports, script, Uncategorized, WP 3 on February 15, 2016 by laureainachus. 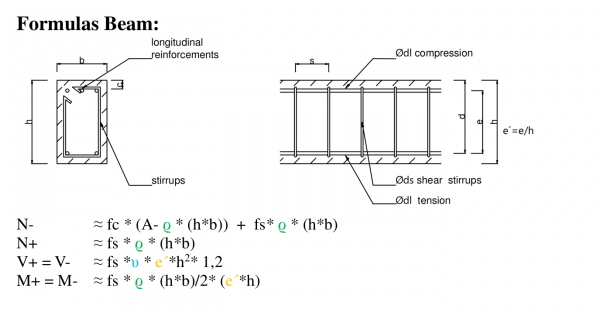 With the support of the engineer office Schüssler-Plan we have collected a set of formulas that is now enabling us to take into account the steel reinforcement in a building element. Steel reinforcement can improve particular strength values. For example to improve the performance under shear force steel stirrups are added, or to improve the resistance against compression and tensile forces longitudinal irons are added etc. These Formulas can now be applied to calculate quite accurately the threshold values we need to be set for our particular constraints. We created an excel table to run the calculations on a test bases. Next we will implement the formulas directly into the BCB- addon. The script will calculate relative strength values: 160131-formulas-calculation, tensile, shear and bend based on a sample element and then apply those relative values in N/mm2 to all the other elements within the same element group. We are waiting with excitement to the results of the first validation cases. This entry was posted in blender, documents, script, Uncategorized on January 29, 2016 by laureainachus. This entry was posted in blender, documents, script, Uncategorized, WP 3 on November 5, 2015 by laureainachus.